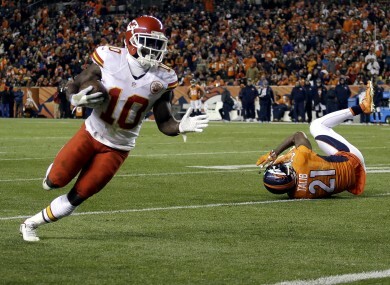 Tyreek Hill helped the Chiefs to a big win Sunday, but should he be in the league at all? Tyreek Hill helped the Chiefs to a high-profile win Sunday. ON 1 DECEMBER 2012, Kansas City Chiefs linebacker Jovan Belcher murdered his girlfriend, Kasandra Perkins, before taking his own life in the car park of the team’s practise facility. Just over two years later, Oklahoma State football and track star Tyreek Hill was due to go to the cinema with his pregnant girlfriend Crystal Espinal. However, a row broke out after Espinal discovers the wide receiver was checking text messages on her phone. After throwing her phone and laptop out of his room, Hill chokes his pregnant girlfriend before punching her in the face and stomach. Espinal gave birth to a healthy baby boy seven months later. Hill was kicked off the team and, after pleading guilty to the assault, picked up a college place at West Alabama where he thrived as a kick returner. However, given the nature of his crime — for which he received a received a sentence that included three years’ probation – it was expected that Hill would go undrafted when the 2016 NFL Draft took place in April. However, in round five, with the 165th overall pick, Hill was drafted by the Chiefs, the same franchise that had to deal with the Belcher tragedy just a few years earlier. The move raised many eyebrows at the time, not just because of the team involved but also because the NFL has mounted a big budget anti-domestic violence campaign in the wake of high-profile incidents involving the likes of Ray Rice or Greg Hardy. Neither of those players are in the league any more and, because of that, NFL teams keep telling us their approach to domestic violence has changed. Indeed, just before Hill was drafted by the Chiefs, the New York Giants signed kicker Josh Brown to a new two-year, $4 million deal despite knowing of his involvement in multiple assaults on his wife Molly. But violence against women is not new — nor, indeed, unique to — the NFL. However, while the league’s arrest rate in general is approximately 13% of the US national average for men the same age, the arrest rate for domestic violence is 55.4% of the national average. That may be comparatively low, but it is still accounts for 48% of all NFL arrests, compared to 21% in the general population. In short, crime is low among NFL players but domestic violence incidents account for nearly half of it. That’s the problem. Back to Hill. By the time his rookie contract is up, he’ll be earning a guaranteed $720,000 a year with the Chiefs and — if Sunday’s performance against the Broncos is anything to go by — a lot more after that. In Sunday’s crucial win over Denver, Hill scored three touchdowns, one of which he was so comfortable on that he was able to high-five his team-mate while running into the end zone. If you’re a victim of domestic violence, seeing Hill practically dance in for the score can’t have been easy. We’re taught that everyone deserves a second chance and his defenders will say that Hill served his time, albeit a suspended sentence, but does that second chance have to involve him potentially making millions of dollars? Let’s remember his crime, he choked his pregnant girlfriend and punched her in the stomach. And yet the message we see time and time again is that, if you’re good at sports, what you’ve done — see – doesn’t really matter. Some team somewhere wants to win and, if they think you are the player than can help them achieve that, then you’ll have a job. For them, and let’s be fair, for a lot of sports fans, winning is the only thing that matters. Email “The Redzone: Winning is still, sadly, all that matters in the NFL”. Feedback on “The Redzone: Winning is still, sadly, all that matters in the NFL”.